There are reports of multiple casualties in Bahrain after security forces stormed the area around the residence of one of the country’s most senior opposition leaders. Pictures and videos from the scene show crowds attempting to block the road to armoured military vehicles trying to make their way into the neighbourhood inhabited by of Ayatullah Isa Qassim in the town of al-Duraz. Security forces fired live rounds and tear gas as they stormed the area causing at least one fatality. Several people are reported to have been wounded, some of them seriously. Ayatollah Qassimi’s house has been a focal point for pro-reform campaigners since last June when the government stripped him of his citizenship on the grounds of fomenting sectarian unrest and serving Iranian interests. Since then, in a gesture of defiance against the Bahraini regime hundreds of protestors have staged a continuous sit-in outside the house. 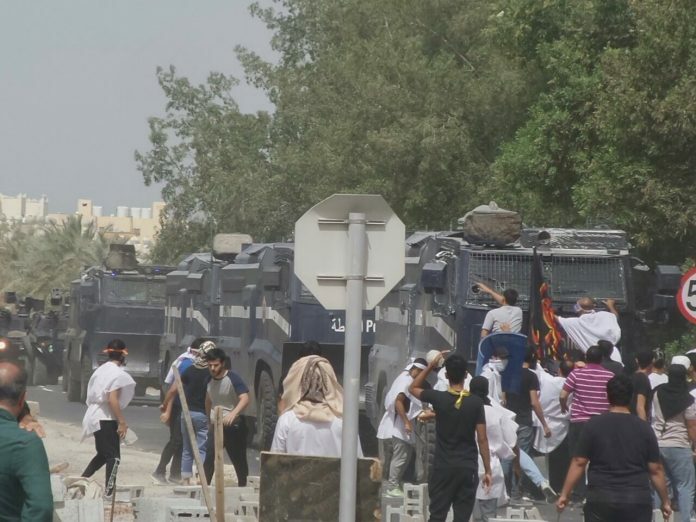 The regime has launched several attempts to forcibly dislodge the protestors. Ayatullah Qassim has been a leading voice for reform in the island monarchy calling for greater civil and political rights for the majority Shia community. The move against him was part of an ongoing campaign of repression aimed at stifling calls for reform of Bahrain’s autocratic monarchical system. It is not clear if today’s move by the government is an attempt to arrest and deport him or to clear the area around his house of protestors.